By 2040, adults age 65 and older will account for nearly one out of three residents of Colorado Springs, a 160 percent increase over the 2010 census. With this growing population in mind, in October 2015 the city joined the AARP Network of Age-Friendly Communities. One year later, the Innovative in Aging Collaborative (IIAC) released "Age Friendly Colorado Springs," a report (downloadable at right) and action plan for improving transportation, housing, outdoor spaces and other key quality-of-life areas. "By working together to implement these initiatives, we can create a Colorado Springs that is a remarkable place in which to age,” wrote Colorado Springs Mayor John Suthers. Does the community you live in have well-maintained and safe parks within walking distance of your home? Does it have accessible and convenient public transportation? How frequently do you interact with friends, family, or neighbors in your community? 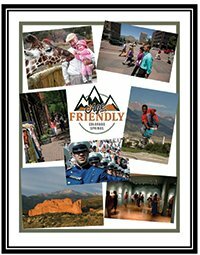 Following the survey, eight IIAC committees, each committed to a separate domain of livability, identified current initiatives that make Colorado Springs age-friendly, pinpointed gaps in services or resources that hinder the city's age-friendliness, and also developed goals and action items relating to each domain. The eight domains are: outdoor spaces and buildings; transportation; housing; social participation; community health and support; respect and social inclusion; civic participation and employment; and communication and information. After the action plan's release in 2016, community leaders committed to implementing it over three years. In 2019, IIAC and the City of Colorado Springs will issue a progress report. One major plus in this foothill city: It offers near-endless opportunities to enjoy the outdoors. Colorado Springs has more than 9,000 acres of parks, 500 acres of trails, and an additional 5,000 acres of open space, including prairies. An estimated 75 percent of residents live within a 10-minute walk of a park. Unfortunately, many of its outdoor spaces don’t have clean bathrooms and benches. To promote age-friendly business practices, the Better Business Bureau of Southern Colorado and the Innovations in Aging Collaborative created the Certified Age-Friendly Business designation. Transportation is a top public issue. Thanks to its sprawling geography, ease of travel in Colorado Springs ranks lower than other similar-size cities. Making matters worse, 65 percent of survey respondents felt the city doesn't have accessible or convenient public transportation. Only 33 percent said they live within walking distance of a bus stop. The city has made strides in making Colorado Springs more bike-friendly. Many options for social participation already exist: 87 percent of survey respondents said they interact with friends and loved ones at least several times a week, and a majority reported daily interactions. But many also said it's a challenge for individuals of different ages to interact together, and residents often miss out on opportunities because there is no centralized resource to find out about community events and other activities. All eight domain committees identified the need for a City Commission on Aging, which could serve as a comprehensive advocacy group to address the issues of aging. The need for a centralized easy-to-use resource center also was widely noted. This resource center should include a centralized database of volunteer opportunities, community events and classes, and a joint call center for residents in need of transportation. It's frustrating for residents to be constantly referred to a different agency or location for each need, the plan's authors note. Transportation was consistently noted as the area most in need of improvement, and one that impacts the ability of aging residents to socialize, work, access healthcare, and more. Developing a ride-sharing program was identified as one solution. Residents and community leaders in Colorado Springs will use this action plan to make their city more livable for their growing population of aging adults. Other communities in the AARP Network of Age-Friendly Communities can look to Colorado Springs’ work as a possible model for their own efforts.